Vanuatu is between Fiji and New Caledonia. Espiritu Santo is an "away from it all" experience where you can take the opportunity to do as little or as much as you need in this unrushed region of Vanuatu. It is truly one of the few places left where in one day you can be on a beach alone if you wish, dive or snorkel with a thousand colourful , explore tribal and ritualistic cultural sites and follow it up with dinner on a jetty overlooking the South Pacic. Santo is the largest island of Vanuatu. The majestic beauty of Santo is what inspired James A. Michener to write his classic “Tales of the South Pacific”. Today, little has changed and Santo remains a Pacific paradise of white sand beaches, lush tropical rainforests and mountainous terrain, with a treasure trove of WWII history to explore. 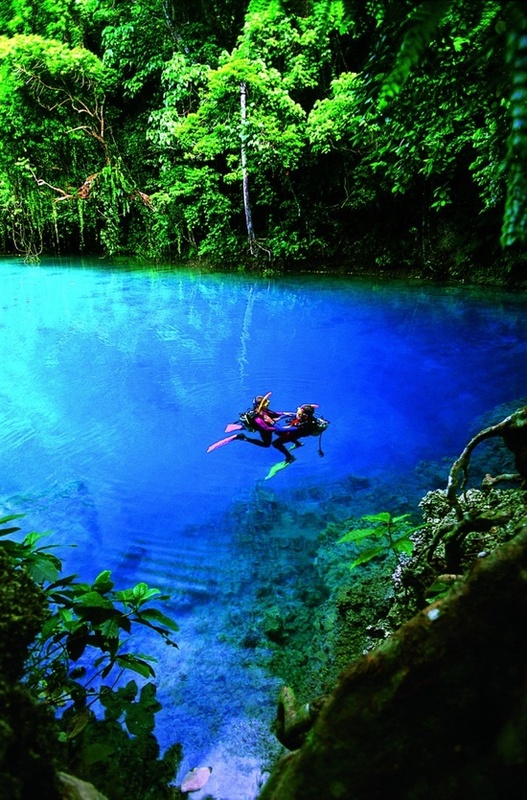 Mysterious water holes of the most amazing blue colour are connected by underground caverns, reef systems of colourful corals teem with a variety of spectacular marine life and the tropical rainforests are home to numerous jungle birds and beautiful wild orchids.